a beehive, filled with a family of indigenous Carniolan bees, you are given the opportunity to discover this tradition first hand! Who lives in the hive? What are the bees doing? What is a typical day of a honey bee? What is the purpose of the Queen Bee? Meet local beekeepers, talk to them. Enter their homes and open your heart to their stories. Learn the deeply humbling realization of how the lives of people and bees are inextricably intertwined. Learn about the modern way of beekeeping the Carniolan bee at Ambrožič beekeeping from Bled. Shop for some sweet souvenirs at Noč beekeeping in Žirovnica and join a guided tour of a traditional Slovenian apiary at the Beekeeping centre of Gorenjska in Radovljica. Local beekeepers from Bohinj will explain how bees live and invite you to observe the bees in the special observation hive. 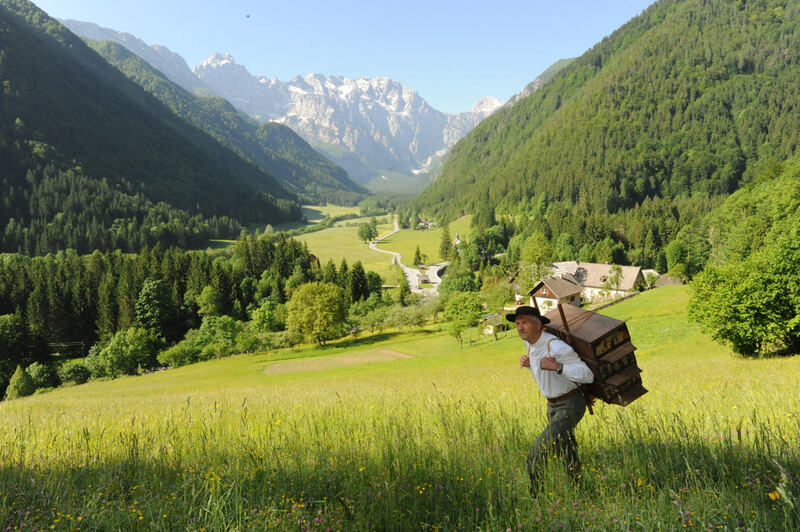 The Bernik beekeeping from Gorje is famous for their special honey pops with cranberries, cinnamon, lemon … while Toni beekeeping from Kranjska Gora invites you on a guided tour of beekeeping with honey and pollen tasting.